This post is about an old and archaic use of labour – the kind that many countries outlawed say about 200 years ago: child labour (although it is important to note the hypocrisy of these countries as even though it is outlawed in their own country they still utilize it on a large scale). This is a topic I have not yet discussed yet throughout any of my posts and unfortunately today it will be a brief post but below I have posted a link from Amnesty International’s website on the subject which also includes a video. This topic is not new of course. In the Democratic Republic of Congo, children as young as seven are sent down mines in unfathomable conditions to mine cobalt for use in things like cell phones. This is so because cobalt still even now does not fall under a “conflict mineral” like gold. Back when child labour was still largely being used and where it should have stopped. The trade of cobalt is global and includes the USA, Europe, South Korea, China and Japan with several multinational corporations who use cobalt such as Apple, Samsung and Sony. These are not small names. The fact that they don’t bother to do background checks (or most likely simply don’t care) is deplorable. These are old-school tactics that must be stopped if we are to achieve a fair and equitable workplace around the world. 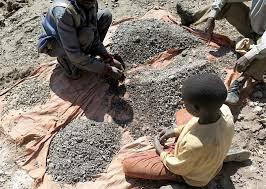 Children need to be educated, not working in mines that are potentially lethal to their health. Sam Hersh is currently pursuing a Joint Honours degree in Political Science and History and is in U3; this is his third year writing for MIR Online. He was born in Montreal and has lived here his entire life. His interests include Canadian and Chinese politics, international labor movements, and a variety of other international issues.